We have three new members from Scotland. See the article about a project they are working on together. Scottish Women’s Aid is the lead organisation in Scotland working towards the prevention of domestic abuse. Members are local Women’s Aid groups which provide specialist services to women, children and young people. These include safe refuge accommodation, information and support. Scottish Women’s Aid provides advice, information, training and publications to members and non-members. Close the Gap works in Scotland on women’s participation in the labour market, and has been operating since 2001. 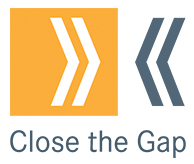 Close the Gap works with policymakers, employers and employees to influence and enable action to address the causes of women’s inequality at work. 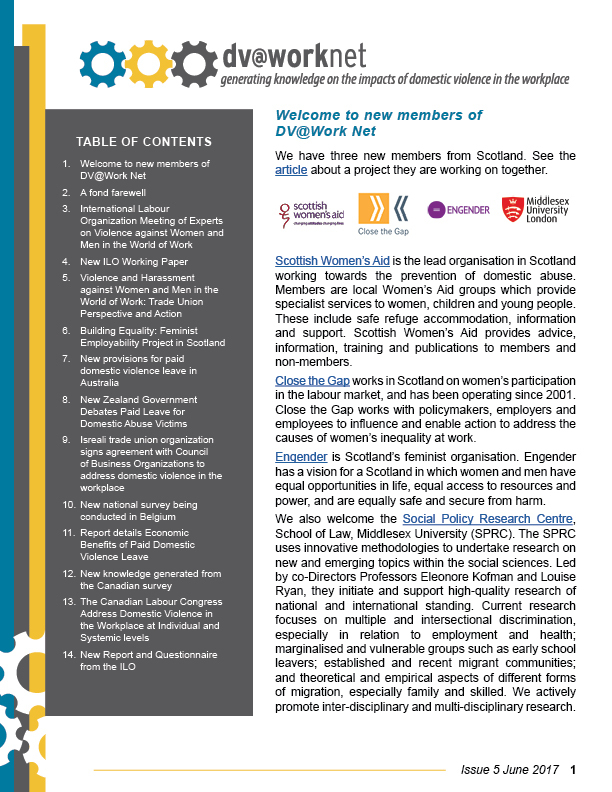 Engender is Scotland’s feminist organisation. Engender has a vision for a Scotland in which women and men have equal opportunities in life, equal access to resources and power, and are equally safe and secure from harm. We also welcome the Social Policy Research Centre, School of Law, Middlesex University (SPRC). The SPRC uses innovative methodologies to undertake research on new and emerging topics within the social sciences. Led by co-Directors Professors Eleonore Kofman and Louise Ryan, they initiate and support high-quality research of national and international standing. Current research focuses on multiple and intersectional discrimination, especially in relation to employment and health; marginalised and vulnerable groups such as early school leavers; established and recent migrant communities; and theoretical and empirical aspects of different forms of migration, especially family and skilled. We actively promote inter-disciplinary and multi-disciplinary research. 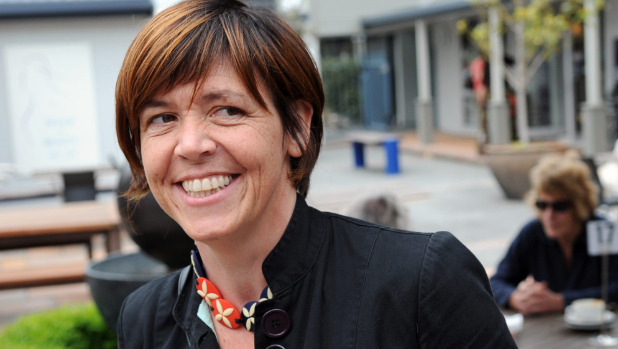 Many members of the Network will know Belinda Tkalcevic who has worked for over twenty years at the ACTU, most recently as Director of Social and Economic Policy. She participated in our 2015 meeting in Geneva and Brussels. 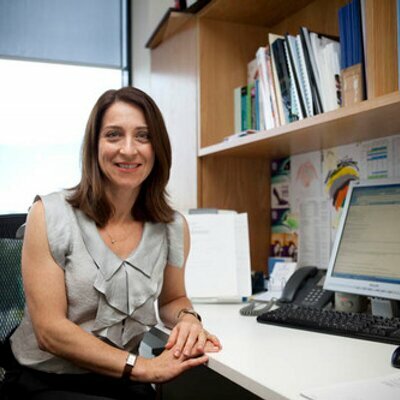 Belinda has decided to move on and we want to recognize and thank her for her support since 2010 at the ACTU. Once convinced, Belinda became a great advocate for domestic violence clauses. She is smart, funny and a good friend. We wish her all the best in the next role she takes. At its 325th Session (November 2015), the ILO Governing Body decided “to place a standard-setting item on ‘Violence against women and men in the world of work’ on the agenda of the 107th Session (June 2018) of the Conference” and “to convene a tripartite meeting of experts to provide guidance on which basis the Governing Body will consider, at its 328th Session (November 2016), the preparations for the first discussion of possible instruments by the Conference”. Provide, on the basis of the above, guidance for the standard-setting item on violence against women and men in the world of work that has been placed on the agenda of the International Labour Conference in June 2018. Guidance could include identifying forms of violence warranting priority consideration and responses thereto. The Experts met in Geneva on 3–6 October 2016. Many members of the DV@Work Network attended the meeting as Experts for their trade union organization or their country. Others attended as observers. 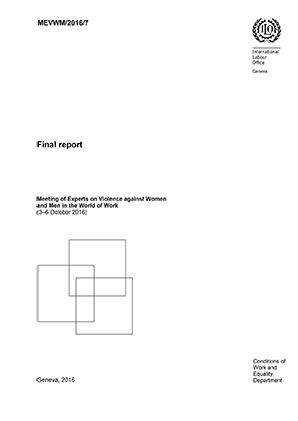 The Experts agreed that domestic violence must be considered along with other forms of violence and harassment in the workplace when the new standard on ‘Violence against women and men in the world of work’ is discussed by the Governing Body at the 107th Session of the Conference in June 2018. 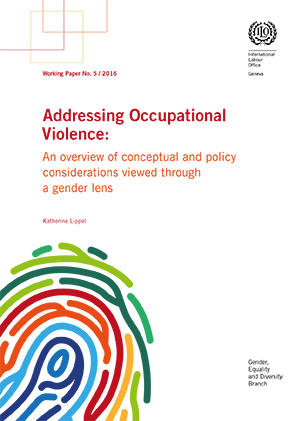 A new Working Paper, released by the International Labour Office, Geneva, Gender, Equality and Diversity Branch will inform the preparations for a standard-setting item on Violence against Women and Men in the World of Work at the International Labour Conference to be held in 2018. Working Paper No. 5 / 2016, entitled, Addressing Occupational Violence: An overview of conceptual and policy considerations viewed through a gender lens paper conceptualizes workplace violence through a gender lens and discusses the design of gender sensitive regulatory strategies for the prevention of workplace violence. 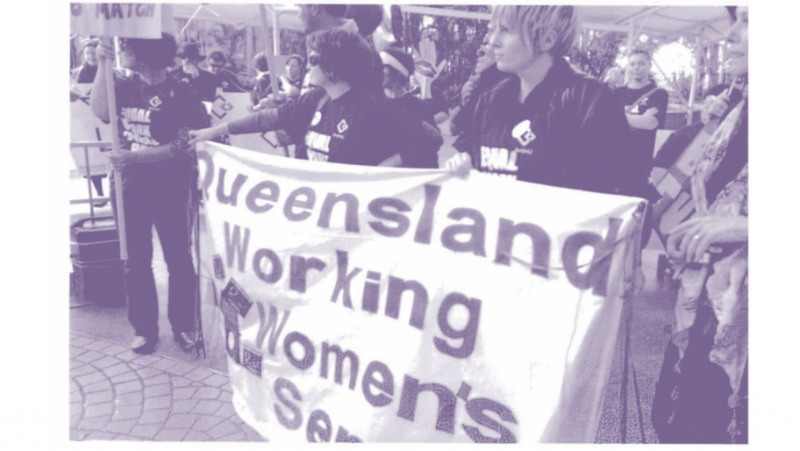 Both this paper and the report discussed below, authored by Jane Pillinger for The Bureau for Workers ‘Activities (ACTRAV) of the ILO, address the issue of DV at work as part of the broader discussion of violence at work. Violence and harassment against women and men in the world of work is an abuse of power. Violence and harassment particularly affect workers in the most vulnerable work situations who have poor access o labour rights such as freedom of association, collective bargaining, decent work, non-discrimination and access to justice. Some groups of workers, and particularly women, are disproportionately affected by violence at work, where unequal power relations, low pay, precarious working conditions and other workplace abuses expose them to violence. The case studies show that bargaining can be considerably strengthened when legislation provides a framework for collective negotiations in tackling violence and harassment at work. 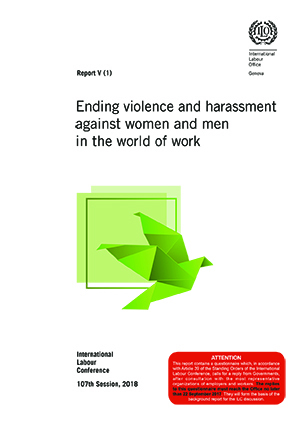 This report has three related objectives: to show the role that trade unions play in preventing and addressing violence at work; to share learning, promote discussion and enhance the role of trade unions in taking a systematic approach to the prevention and elimination of violence and harassment at work; and to inform trade unions in building a strong position at the International Labour Conference in 2018 and developing a standard-setting item on violence against women and men in the world of work. Building Equality is a new joint employability project led by Scottish Women’s Aid which addresses economic discrimination to build resilience and reduce vulnerability of women and children experiencing domestic abuse. Scottish Women’s Aid is the lead organisation in Scotland working towards the prevention of domestic abuse and playing a vital role campaigning and lobbying for effective responses to domestic abuse. Working with project partners Close the Gap (Scotland’s experts on women and the labour market), and Engender (Scotland’s feminist membership organisation), and with national infrastructure organisations and 3 local Women’s Aid groups, the project will develop models for community-based, gender- and domestic-abuse-competent employability supports as part of a holistic support service for women experiencing domestic abuse. Women experiencing domestic abuse have increased financial independence (access to economic resources, education, paid labour market, routes out of poverty). Services supporting women experiencing domestic abuse have increased knowledge, resources and confidence to respond to their employment and educational support needs. Services are better connected to local and national employability supports. Strategic local and national employability systems better reflect the economic needs of women who have experienced domestic abuse. The project is funded by the Scottish Government. The trend in Australia has been for governments to introduce public service provisions. The recently elected Labor state government in Western Australia has committed to introducing domestic violence provisions for its public sector. This will mean that all Australian governments, national and state, provide such provisions. However, there is little national continuity. Provisions are provided through a variety of measures including legislation, awards, agreements and guidelines, and leave provisions vary from access to personal leave to up to 20 days additional paid leave. The NSW Crown Employees (Public Service Conditions of Employment) Award 2009 (and a further 60 State Government Awards linked to this provision) provides access to family and community services leave, sick leave, and an additional five days leave per calendar year (if the above leave entitlements have been exhausted). The Northern Territory Government Commissioner’s Guideline for Miscellaneous Leave (domestic, family and sexual violence) 08/2012 provides a ‘reasonable period’ of paid leave available from accrued ‘miscellaneous’ leave. The Tasmanian Ministerial Direction No. 28 Family Violence- Workplace Arrangements and Requirements 11/12 provides access to personal leave and further ‘special’ leave when exhausted. The ACT Public Service Agreements 2013-2017, clause F22 provide dedicated paid domestic violence leave of 20 days. The Victorian Public Service Agreement 2016, clause 48 provides 20 days additional family violence leave. South Australian Public Sector Wages Parity Enterprise Agreement 2016 provides 15 days paid domestic violence leave. The Australian Public Service Circular 2012/3: Supporting Employees Affected by Domestic or Family Violence 10/2012 provided access to personal leave, and where exhausted ‘understanding should be shown and reasonable allowance made for employees affected by domestic or family violence’. New Zealand’s Parliament debated a bill proposed by Green Party MP Jan Logie to classify domestic violence as a workplace hazard and would therefore allow victims to take up to ten days of additional paid leave from work. The bill came up for debate as Justice Minister Amy Adams promises an overhaul of the country’s domestic violence laws in the coming months. New Zealand has one of the worst rates of family violence in the western world. Between 33 and 39 percent of New Zealand women experience physical or sexual violence from an intimate partner at some point in their lifetime. Prior to the introduction of Logie’s bill, New Zealand-based charity Women’s Refuge published a study on the effects of domestic violence on working people. A survey of 450 victims found that a majority – over 60 per cent – were employed full-time before they began an abusive relationship. However, little more than 27 per cent kept their jobs throughout the time they were with a violent partner. Despite resistance from members of the government, the bill has received support from a number of employers, including the professional organisation Business NZ, who said the idea was worth a closer look. Workplaces which already offer leave to victims tend to be larger companies so it would be a good idea to find out what the costs of such legislation would be to smaller businesses, the group suggested. The Histadrut, Na’amat (The Histadrut’s women movement) and the Presidium of Business Organizations, signed a convention on the assistance of workplaces to women harmed by domestic violence. Histadrut Chairman Avi Nissenkorn and Chairman of the Presidium of Business Organizations Shraga Brosh signed a joint convention on 24.11.16 in which they obligate themselves to work together for raising the awareness of domestic violence, providing assistance to the victims and eradicating the phenomenon through workplaces. The convention was initiated by Galia Wallach, Chairman of Na’amat, in preparation for the International Day for the Elimination of Violence against Women which occurred on 25.11.16. The convention is intended to reflect the undertaking of the workers and employers in the country for raising the awareness of violence against women. Na’amat explained that the idea of the convention was born out of the recognition that violence in the home environment is not just a problem of the individual, but a widespread social problem, which is deeply rooted in cultural, structural and socio-economic factors, and affects the entire Israeli society. The convention, which outlines a series of principles and proposals for action, is based on the important role given to workplaces in eradicating this phenomenon and providing assistance to the victims. As part of the convention, the heads of the organizations obligate themselves to work for making information accessible in the workplace on domestic violence through informational materials and lectures, to make sure to create a supportive climate and to assist in connecting the female workers in distress to people who provide treatment and assistance. It was also agreed that the Histadrut and the Business Organizations will establish a joint steering committee for examining the promotion of the goals that are detailed in the convention. The Institute for Gender Equality in Belgium wants to learn more about the impact of partner violence on the working environment. In order to gain a clearer picture of the scope and the impact of intimate partner violence on the working environment, the Institute for Gender Equality is conducting a national survey in collaboration with The University of Western Ontario in Canada and three Belgian unions, the FGTB, the CSC and the CGSLB. In this survey, workers are being asked about their experiences of intimate partner violence, how it affects their work performance, what kind of support, if any they received at work, and the role that the workplace could play in addressing this problem. The results of the survey and recommendations of the Institute will be presented during a study day in the fall of 2017. Economic insecurity is one of the greatest factors inhibiting victims of domestic violence from escaping violent situations at home. To address that problem many unions are bargaining for entitlements to paid domestic violence leave. Some employers have also developed their own leave provisions. The leave allows victims to attend legal proceedings, medical appointments, or other events or activities related to the violence they have experienced, without risk of lost income or employment. 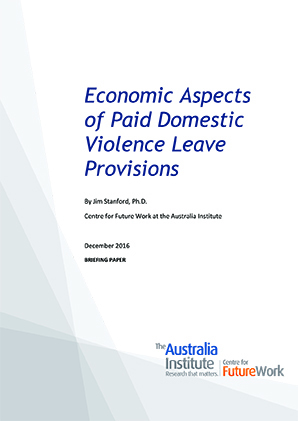 Recently, Jim Stanford, economist and director at the Centre for Future Work conducted research on the cost of providing paid domestic violence leave to employers in Australia. He concluded that the cost of providing this paid leave would be “modest”, especially compared to the vast costs of domestic violence, which are estimated to cost Australia $21.7 billion a year. Only about 1.5 per cent of female and 0.3 per cent of male employees would likely use paid domestic violence leave in a year. The study said there is evidence to confirm the provision of paid leave for employees does not in any way “open the floodgates” for large numbers of workers simply seeking to get two weeks’ paid absence from work. The cost would be between $80 million to $120 million per year for the whole economy. The increase in wage payouts would be equivalent to less than one-fiftieth of 1 per cent (0.02 per cent) of existing payrolls. The analysis found the cost to employers would be “largely or completely offset” by reduced turnover and improved productivity. The main paper, freely available in full text in the Journal of Occupational and Environmental Medicine (link below) showing that More than a third of respondents reported experiencing DV; among them, more than a third reported that DV affected their ability to get to work, and more than half reported that it continued at or near work. Most reported that DV negatively affected their performance. Almost all respondents, regardless of DV experience, believed that it impacts victims’ work lives. Women and trans* people were more likely to report these experiences than were men. A paper in Journal of Interpersonal Violence that examined the link between DV, work and health, which found robust relationships among different kinds of DV exposure (current, recent and lifetime), health and quality of life, and employment status, including the potentially protective effect of current employment on health for both women and men (full text available on request). 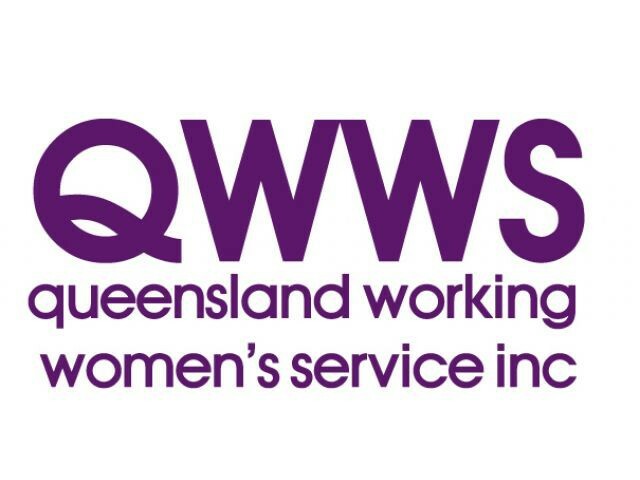 Several other papers examining issues such as the impact of DV on co-workers, and what kinds of workplace resources and supports are available, including awareness and use of these (links below). A paper is also in progress on the large sub-sample of approximate 670 people who identified as LGBTQI+, to explore their specific experiences of DV at work; a poster on the trans* sub-sample was presented at a Nursing Network on Violence Against Women International conference in Melbourne, Australia last October, winning the Research Poster Award, and presentation on the new analysis has been accepted for the Sexual Violence Research Initiative Conference in Rio de Janeiro in September 2017. MacGregor, J. C. D., Wathen, C. N., & MacQuarrie, B. J. (forthcoming). Resources for domestic violence in the Canadian workplace: Results of a pan-Canadian survey. Journal of Workplace Behavioral Health. A 1-hour Base-level Presentation Aimed at Workers - the presentation covers information like how to recognize warning signs of domestic violence and what to do if you believe a co-worker is experiencing or committing domestic violence. The aim is to build awareness of DV and its impact on the workplace, creating a safer atmosphere for people to seek support. Training for Union Representatives - at least two days long, this workshop model is meant to be delivered either on its own or integrated into other courses. It’s designed to help those who work directly with members – shop stewards, health and safety representatives, women’s advocates and other “first responders” -- recognize and respond to incidents of domestic violence and includes role playing scenarios, video content and training. Facilitator training - this intensive training with a small, hand-picked group will work nationally or regionally to deliver the training for Union Representatives or other educational programs. Trainers will be highly skilled and knowledgeable on women’s issues or workplace violence. 1-Day or Online Training - geared toward leaders and negotiators on why domestic violence is a union issue, legal obligations, how to address it, and examples, this informative training is a great beginner option. The series will help increase union capacity to build awareness about domestic violence and address DV@Work at individual, workplace and systemic levels. It will train workshop facilitators and empower first responders who work with union members and other workers who may be experiencing domestic violence. It also equips union representatives and leaders with information and tools to recognize and respond to DV@Work, and refer workers to sources of support at work and in the community. The outcome will be a cross-country response to DV@Work. By working in collaboration with Union “champions” hundreds of union members will become activists and educators – working to address DV@ work at individual and systemic levels. Tools for elected leaders and negotiators; first responders (including staff, stewards, women’s advocates, Health and Safety representatives and others likely to be representing members) and rank and file members can be found on the online portal, housed on the CLC’s website. The Canadian Labour Congress (CLC) is a partner in the international Domestic Violence at Work Network (DV@WorkNet), a group of researchers, domestic violence, experts, social and labour organizations, and employers. Leaders are proud of this work and want the collective efforts to make a real difference in the lives of CLC members and to help build workplace safety. A new report, Ending violence and harassment against women and men in the world of work, from the International Labour Conference 107th Session, 2018 is now available. The report contains a questionnaire which calls for a reply from Governments, after consultation with the most representative organizations of employers and workers. The purpose of the questionnaire is to request the views of member States on the scope and content of the proposed instrument or instruments. The replies, which are due no later than 22 September 2017 will form the basis of the background report for the International Labour Conference discussion in June 2018. There are specific questions relating to DV at Q29 and Q38. Members of the DV@Work Net are encouraged to review the questions and provide feedback to their ILO State Representatives.